Here’s a video that shows Jay Rock and several other artists talking about the animated TV show The Boondocks. 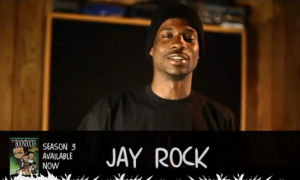 Jay Rock is the second to share his thoughts on the show, saying: “That episode was just too funny to me”, when referring to the episode that features Thugnificent, which he cites as his favorite. Omarion (whom Jay Rock performed “Hoodie” with on BET’s 106 and Park) appears after Jay Rock. The clip also features Snoop Dogg, E-40, Paul Wall, and other rappers.